This week our city’s newest amenity comes online: Klyde Warren Park. Now that we have glorious palaces for high culture, bridges into developing communities, and burgeoning opportunities to live downtown, the next accomplishment to celebrate is a green attraction with an identity open for interpretation by every visitor. 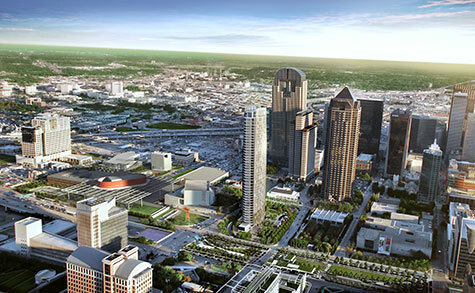 The DMA staff looks forward to the impact of a pedestrian-friendly destination just steps from our front door. The car culture of Dallas is not unique, but whatever we can all do to encourage residents and visitors to stretch their legs and open their eyes can only improve the quality of life for all in our city. Parks and museums share a great deal—we welcome people of all backgrounds, regardless of particular interests, we offer an informal setting for conversation and relaxation, and we don’t prescribe a route, a timetable, or an outcome for your visit. We both try to offer a respite from the commercial din of contemporary life, some perspective on daily life, and enjoyment that comes from a freedom to wander and explore without confinement. We look forward to collaborating with the Park as it gets underway with programming, and to accelerating the pedestrian-friendly potential of the Dallas Arts District in a variety of ways. Welcome to the neighborhood, Klyde Warren Park! Celebrate the grand opening of Klyde Warren Park this weekend. The DMA will move the Studio Creations program outside on Saturday and Sunday from 1:00 to 3:00 p.m., and on Sunday our Maya ballgame demonstration with Grupo Pakal will be held at the Park at 1:45 p.m. Visit the Park’s website for a complete list of events. Maxwell L. Anderson is The Eugene McDermott Director at the Dallas Museum of Art.